Baked crab by Catherine Ford, on Flickr (CC license). Coquille is just French for shell. Imperial, in this context, means mixed with mayonnaise or béchamel and baked in sort of an au gratin preparation. So really, this is crab au gratin in crab shells. If that seems like a bit of a loose definition, consider that, when you see it these days (typically on a banquet menu or in a country club), it’s stuffed into another fish and goes under the name of the fish: sole imperial, flounder imperial, and so on. The original, crab-only preparation isn’t too frequently seen outside of the Chesapeake bay area in the summer, when blue crabs are cheap and the population isn’t frighted off by the shells. Choose at least one from each column, mix with crabmeat, and bake. The bit of embellishment that seems unusual on this card is the use of an anchovy fillet instead of capers or Worcestershire sauce. Crabs are at their best here and all cafes serve them. 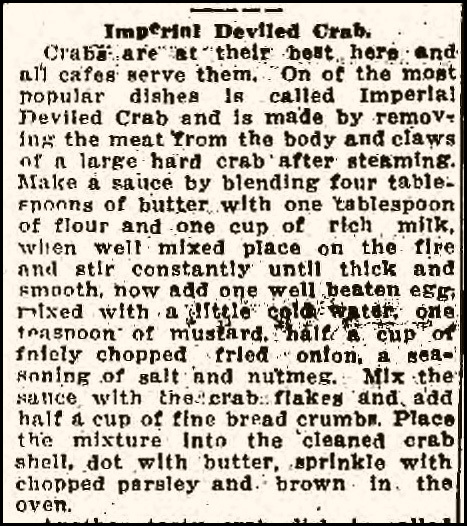 One of the most popular dishes is called Imperial Deviled Crab and is made by removing the meat from the body and claws of a large hard crab after steaming. 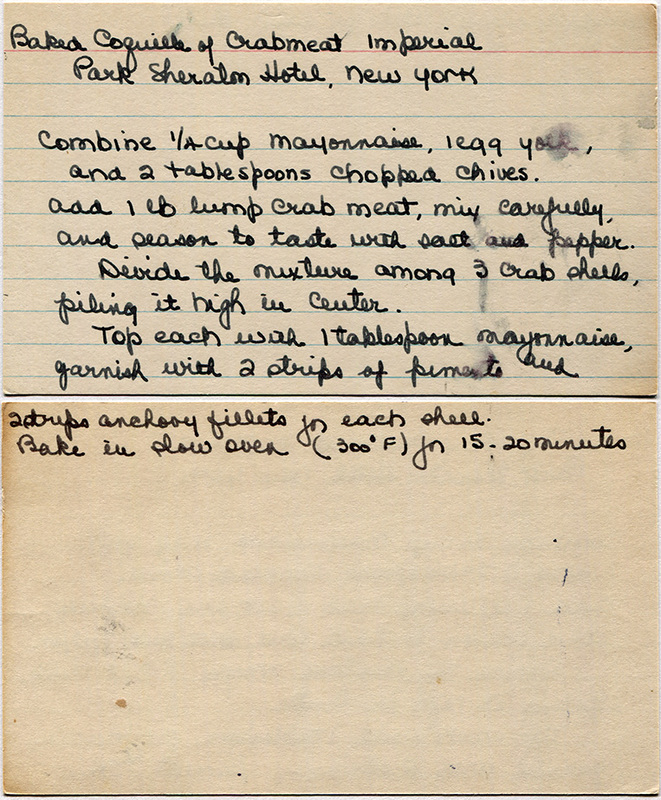 Make a sauce by blending four tablespoons of butter with one tablespoon of flour and one cup of rich milk; when well mixed place on the fire and stir constantly until thick and smooth; now add one well beaten egg, mixed with a little cold water; one tablespoon of mustard, half a cup of finely chopped fried onion, a seasoning of salt, and nutmeg. 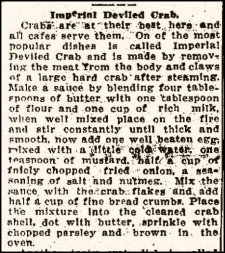 Mix the sauce with the crab flakes and add half a cup of fine bread crumbs. 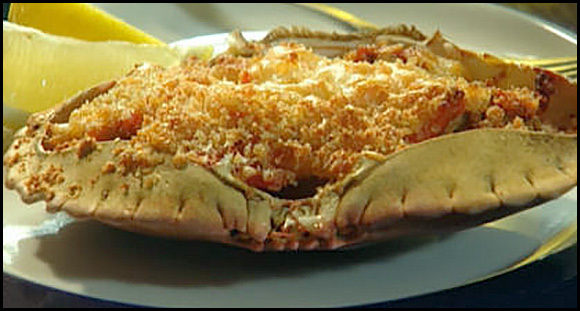 Place the mixture into the cleaned crab shell, dot with butter, sprinkle with chopped parsley and brown in the oven. In general, preparations like this vanished from most restaurants by the end of the 1960s, when casseroles took over at home. But that’s not the real question of this recipe, is it? The real question: why does a recipe box from the Detroit area in the 1950s have a recipe attributed to a hotel in New York City? Well, I have a theory. But get a snack, because it’s a long story. And to tell it, we need to start in 1941, in Miami. I didn’t have to work till I was three. In February of 1941, singer, actress, and household name Martha Raye was between acting jobs — and husbands. As two human beings, they had seemed to complement each other so well that it took them over a year to realize they didn’t intersect. Worse, though, was that at the time she filed for divorce, Raye knew that the 30-year-old Rose had started seeing someone else: an 18-year-old who was also a household name, Judy Garland. And now, here was Martha Raye, soon to be 25, ad-libbing at the Royal Palm with Milton Berle. Rumor was that Rose and Garland were going to get married as soon as the final divorce papers were signed. The Royal Palms nightclub (now part of the Royal Palm Resort) was about a seven-minute walk from the Raleigh Miami Beach Hotel down Collins avenue in South Beach; plan for 20, if you walk on the sand instead. 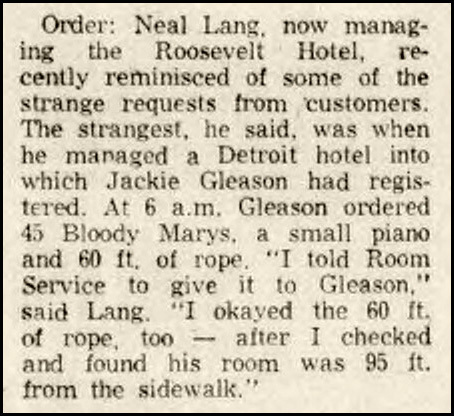 It’s a trip that the manager of the newly-built hotel, Neal Lang, made in 1941, not realizing that it was going to change the next few years of his life. Lang and Raye started showing up in gossip columns in February; by May, they were married, eloping to Las Vegas the month before Rose and Garland made the same trip. Actress Ann Sheridan attended the wedding. But it was a working honeymoon for Raye, who flew back to Hollywood with Sheridan the next day to work on the film Navy Blues together. Navy Blues starred Jack Oakie and Jack Haley (the latter famous primarily for his 1939 appearance as the Tin Man in a little Judy Garland picture you may have heard about) as sailors trying to rig a gunnery competition while on layover. Raye played the suffering wife of Haley’s sailor, selling cigarettes and singing in a club while she waits for his return. Blues also was the film debut of a nightclub comic who had the good luck to insult a Warner executive with enough creativity to get signed. Billed as Jackie C. Gleason, the 24-year-old future Ralph Kramden had few lines, but delivered them all with his trademark mixture of menace and charm. Here’s a small clip of Navy Blues; Gleason warns, “YOU… are only temporary!” and Raye holds off the bloodthirsty crowd of sailors so she’d have first crack at her neglectful husband. As Pitrone writes, Gleason and Raye went drinking regularly together and competed to pay the check. Both were, after all, the center of any good time. Through that friendship, it’s likely that Gleason at least knew of Lang, and vice versa. 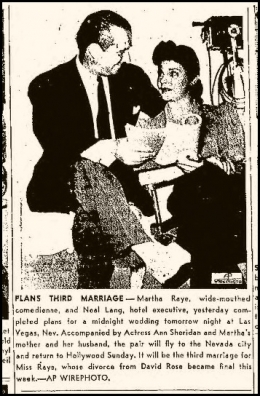 Raye and Lang continued to work apart; in November of 1941, a newspaper reported that Lang would file for divorce in Miami. But Pearl Harbor put that off; Lang was commissioned an Army Captain and sent to England, and Raye signed up to perform in the first of her three wartime USO tours. 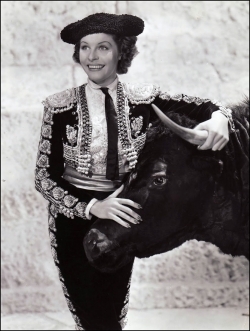 Raye would ultimately file for divorce in 1943 in Juarez, Mexico — so she could marry her fourth husband, Nick Condos. Lang continued to work as a hotel manager in Miami. Garland and Rose would divorce in 1944. For his part, Gleason discovered he hated making movies, at least at this point in his career. They wanted to do everything over and over, shooting one scene for half a day; he thought it was boring and cut into his drinking time. He decided to head back to New York — though he spent all of his money by the time he reached Arizona. As the story goes, he convinced a hardware store owner to cash a personal check (people didn’t cash out-of-town checks in those days) by taking him to see Navy Blues and proving he was in the picture, then used the money to get back to the Big Apple. The Raleigh was a Sheraton hotel, and in 1949, the still single Neal Lang was brought to the Park Central Hotel when it became the Park Sheraton. (Today, it’s back to being the Park Central, managed by Highgate Holdings.) At 7th Avenue between 55th and 56th, it’s about six blocks from the theater district, three blocks from Central Park, two blocks from Fifth Avenue, a block from Broadway, and across the street from Carnegie Hall. 1953 ad for the Park Sheraton. Note that there’s a bit of forced perspective here; the middle tower of the hotel tops out at 30-ish stories tall, compared to the 102-story Empire State Building in the background. I don’t know if I can adequately express to you the magnitude of how big this hotel was by the standards of the day. At the time, the hotel itself advertised 1,600 rooms; some have since been converted to condos, leaving the modern incarnation with 934 rooms. By comparison, the Raleigh Hotel in Miami was 108 rooms. The Park Sheraton could fit fourteen times the guests with 88 rooms left over. And what guests. Many celebrities made the hotel their home for periods of time, including Walter Winchell, Joe Louis, and Mae West. In 1950, Eleanor Roosevelt moved in; but the celebrity who would come to be most associated with the Park Sheraton wouldn’t arrive until 1952. Jackie Gleason was starring in a live variety show on the fourth place DuMont network on Saturday nights titled Cavalcade of Stars, most notable for a segment called “The Honeymooners.” A guest appearance on his drinking buddy Frank Sinatra’s variety show drew the attention of CBS chief Bill Paley, who hired Gleason in 1952 with a $10,000 a week salary. 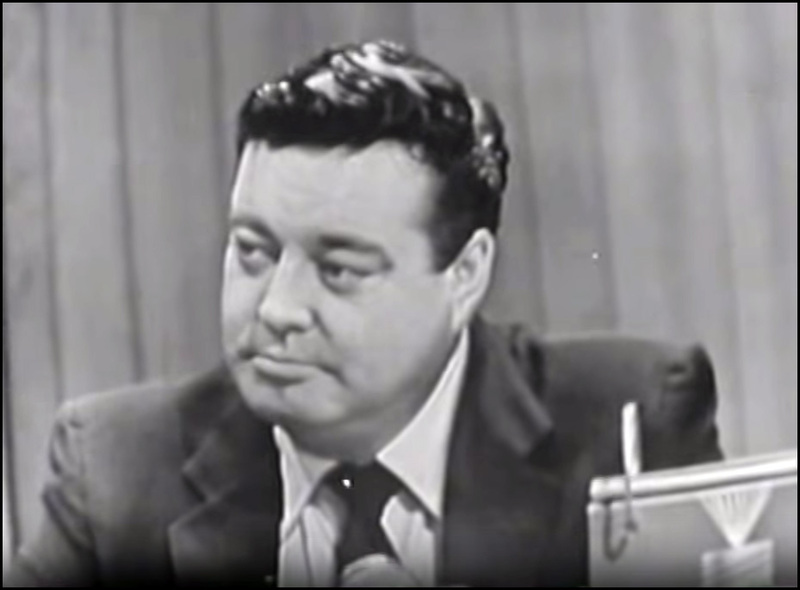 Gleason, who by this time had acquired the nickname The Great One (supposedly given to him by Orson Welles, impressed by Jackie’s memorization of Shakespeare), moved himself into a penthouse of the Park Sheraton and made it the headquarters of Jackie Gleason Enterprises. It would be impossible to do Jackie Gleason justice in this small space, except to say that he was both a great talent and an immensely difficult human being in the best possible ways. He had been gifted with a photographic memory for scripts and therefore felt rehearsals were only harmful to him; he expected the rest of the cast to practice without him so he could deliver his lines live, while still drinking liquor from a teacup. 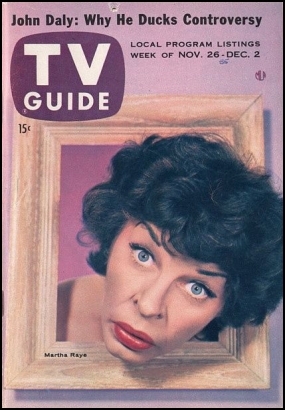 Incidentally, Martha Raye was starring in Musical Comedy Time on alternate Mondays on NBC in 1951, and occasionally on “All Star Revue” on Saturdays. 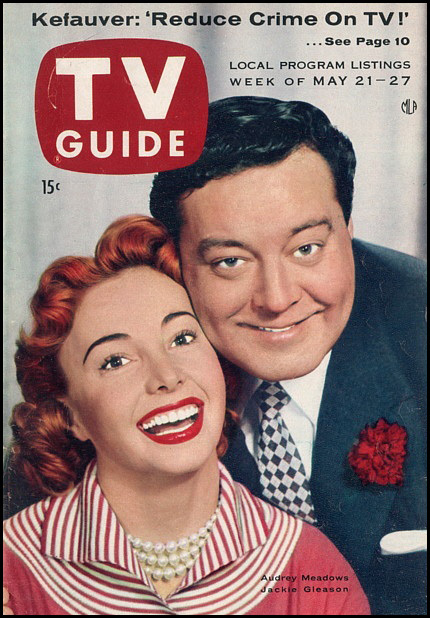 She’d get her own show a few years later; it lasted two seasons before being cancelled, unable to compete with Jackie Gleason’s variety offerings. 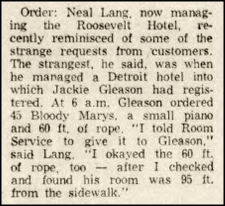 In 1952, just as Jackie Gleason was moving in to the Park Sheraton, Neal Lang was moving out, having been assigned by his superiors to the 1100 room Sheraton-Cadillac Hotel in Detroit. And oddly enough, we’ve actually seen this hotel before, under its original name; the Book-Cadillac Hotel is where the Arnfelds got married in 1935, as we learned in the post for Chocolate Chip Cookies from this box. After the meeting I had time to stop for a few minutes in the hotel and see Mr. and Mrs. Neal Lang and their young son, aged 14 months. 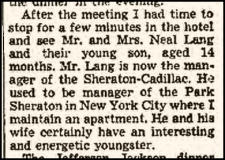 Mr. Lang is now the manager of the Sheraton-Cadillac. He used to be the manager of the Park Sheraton here in New York City where I maintain an apartment. He and his wife certainly have an interesting and energetic youngster. Why the 60 feet of rope? Some things are beyond even my research. But knowing Jackie Gleason, it could easily have been a prank. So was this actually on the menu at the Park Sheraton Hotel? It’s likely, for a few reasons. But I can’t prove it yet. I’ve reached out to the Park Central’s current management and asked if they could take a look; I’ll let you know what I hear back. So why do I think this is from the right time period? 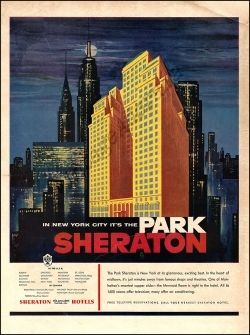 First, the hotel only had the name Park Sheraton from the late 1940s until 1972, when it became the New York Sheraton. Second, looking at the dishes, they certainly make more sense in the early 1950s than they do in the 1960s, especially the drinks. Instant Postum was only popular with the general public during World War II; it’s a coffee substitute, basically, made from roasted grain. (This is already an epic post — we’ll talk about Postum another time.) 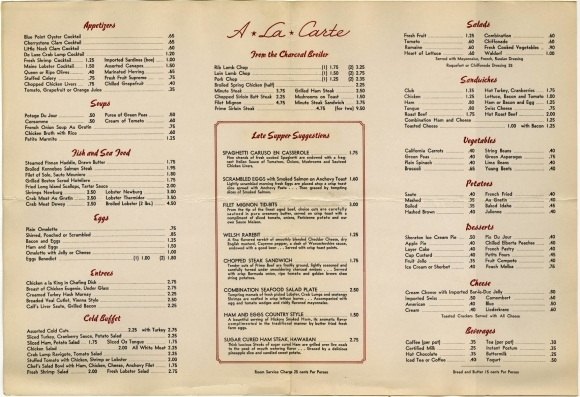 So it’s far more likely that this menu was from the earlier part of the hotel’s time as a Sheraton. 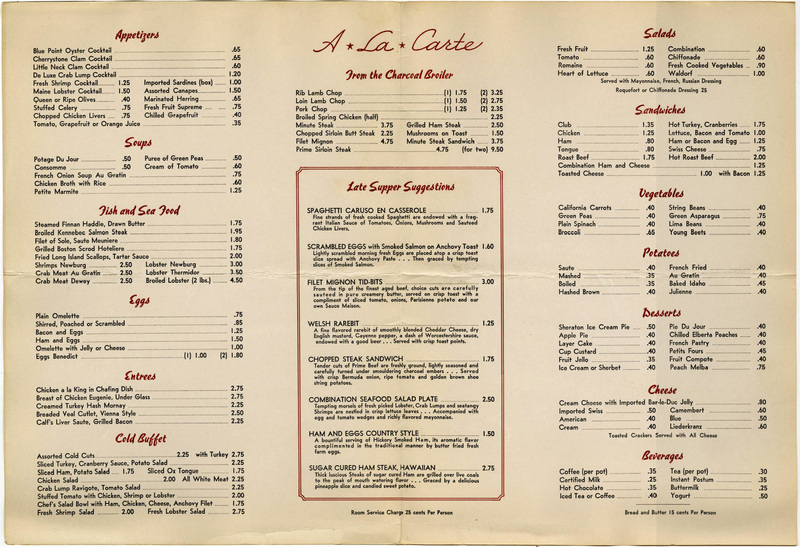 Another clue is in other menus from hotels Lang managed; the Plaza in 1960, for example, served crab Remick in its Persian Room, which is basically the same recipe as this Crabmeat Imperial, substituting bacon and croutons for the pimento and anchovy. That said, lots of place served some sort of baked crab preparation, so these signs are only slightly more probative than pointing out that they all served tomato juice. But the ubiquity cuts both ways; Lang must’ve encountered dozens of crab recipes, so it’s not that much of a stretch that he’d have brought a couple along when he moved. That makes only nine total weddings, however, because (obviously) Lang and Raye overlapped in one of those weddings. No sense in counting it twice, right? 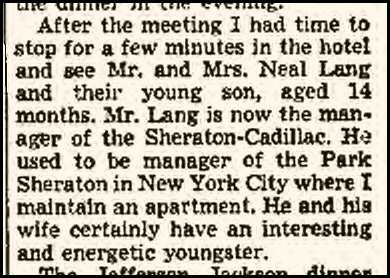 Lang would go on to co-own the Jamaica Arms restaurant in New York; he died in Palm Beach in 1990. 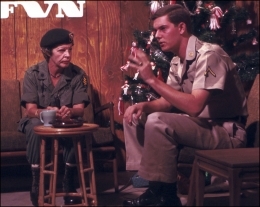 Colonel Maggie on American Forces Vietnam Network TV in 1968. Photo from Richard Ellis, on Flickr (CC license) (cropped). She was an honorary Lieutenant Colonel in the Army, an honorary Colonel in the Marines, and an honorary Green Beret; she was, in fact, the only woman to receive that honor until after the end of the war, and was the only woman given permission (by LBJ) to wear the uniform during the war. President Clinton awarded her the Presidential Medal of Freedom in 1993, a year before her passing. When she died, special permission was given for her to be buried in the Special Forces cemetery at Fort Bragg, North Carolina. Add 1 lb. lump crab meat; mix carefully and season to taste with salt and pepper. Divide the mixture among three crab shells, piling it high in the center. Top each with 1 Tablespoon mayonnaise; garnish with two strips of pimento and 2 strips anchovy fillets in each shell. Bake in slow oven (300 deg. F.) for 15 to 20 minutes. I worked for a firm that had an office in the Sheraton Cadillac, during its downward slide in the 1970’s. We were on the top floor but on many days had to use the freight elevator.